Visiting a new winery is a thrill that never gets old! We were very excited to see that a winery had opened across the street from the Rock Wall Wines tasting room in Alameda. With great anticipation, we had our first tasting experience at the Building 43 Winery. The decommissioned Alameda Naval Air Station is undergoing a transformation. Monarch Street has become something of a focal point for alcoholic beverages. There are several distilleries and wineries within walking distance of each other. Park once, sample wine and spirits all day. Then Uber home, of course. 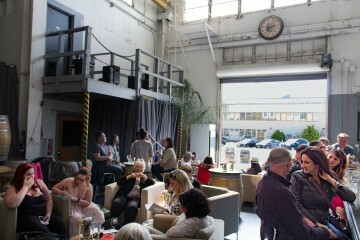 Lots of room to sip, mingle and relax! The Building 43 Winery is in… wait for it… building number 43. It says so, right on the building in very large type. And the Navy is never wrong, so naming the winery Building 43 made a whole lot of sense. We walked across the street after our tasting at Rock Wall toward this solid concrete building that had been cleverly reimagined as a tasting room. We entered to find a long tasting bar along one wall and clusters of comfortable-looking couches and upholstered chairs filling the space. A great arrangement for sipping and having a good time! Upon settling in, we discovered that a good number of visitors were there to celebrate a wedding shower! 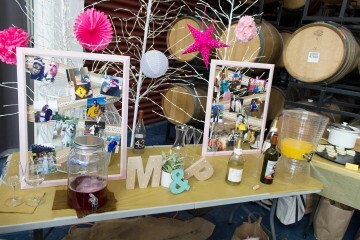 The added food displays, photos, decorations and joy added a nice extra touch to the day. Their celebration was well along, so they didn’t spend much time competing for wine pours, which was nice, too. If the marriage is as full of fun as the shower, the couple will have a great life together. About then, we met Meredith Coghlan, one of the owners. She was running the tasting room pretty much single-handedly, but was able to make every visitor feel welcomed and appreciated. She started us with their 2012 Chardonnay, from Mendocino grapes. Delivered unfiltered from neutral oak, we enjoyed the buttery lemon flavors. 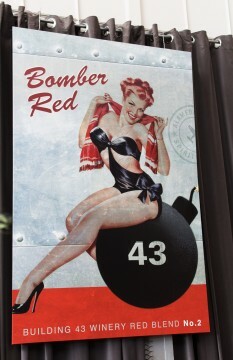 Their 2012 Bomber Red #2 was a blend of Malbec, Syrah and Petite Sirah. This was a pleasant cacophony on the tongue, with swirls of blueberry and plum, and a Zin-like finish. Quite an interesting blend! Next up was their 2011 Petite Sirah Reserve. This turned out to be the “best taste” of the winery with our group! Spending more than three years in the barrel, we loved the coffee, blackberry and caramel notes, with a hint of citrus on the finish. This one came home with us! We like the 2009 Petite Sirah and 2011 Syrah, but REALLY fell in love with their 2010 Dessert Wine, all caramel and toasty, with sneaky hints of strawberry for some of us! After a while, we realized that we were soaking in the vibe of the room, with the tasting menu complete. This really wasn’t fair to other tasters, so we purchased our wine, thanked Meredith for the hospitality and headed off. 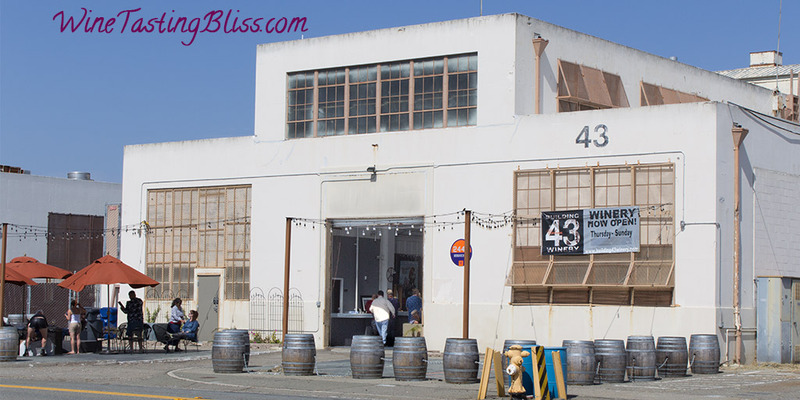 Have you visited Building 43 Winery? Click to give'em a tweet of support!